'Eagle Rock', the Henry Clay Frick estate designed by Little & Browne c. 1904 in Prides Crossing, Massachusetts. Frick was the founder of H.C. Frick & Company and later chairman of Carnegie Steel. The house was demolished c. 1969. 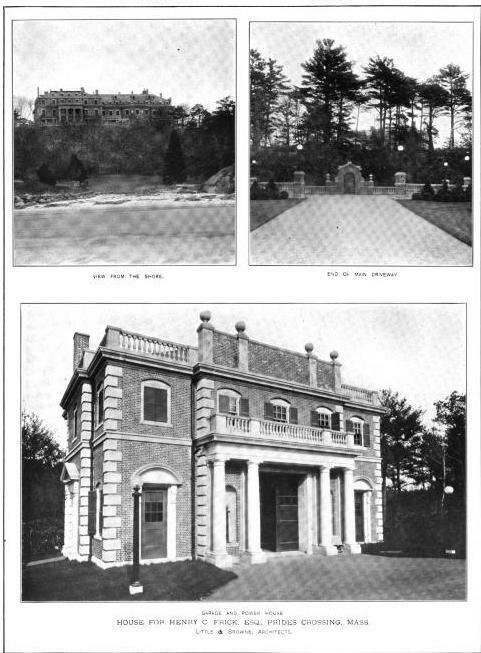 Joseph Donon, who came to America as the Frick family's chef in 1912, said that Eagle Rock was the first place he worked in his new country, and that the house was "pretty near as big as The Breakers !" 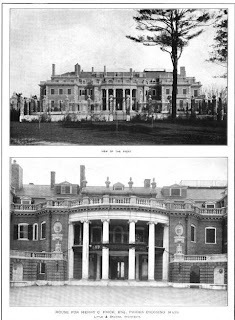 I was also told that on both sides of Hale Street, at Prides Crossing, bordering the Frick summer estate, were long stretches of high wrought iron fencing between stone piers. The fencing along the side opposite the area where the mansion stood on its high ledge was donated to the scrap metal drive in the 1940s by Miss Helen Clay Frick. The man she hired to remove it never sent it to the scrap heap but kept it stored on his property until, in the 1950s, he sold it to newly rich folks building their own estate. Everyone in the town knew of it but no one had the courage to tell Miss Frick ! Today, anyone passing down Hale Street will see the wrought iron fence on the Eagle Rock side, and wooden fencing betwen the stone piers on the opposite side. When I was a child, newly infected with the big house virus, a ride along Hale Street, between the Frick fences on either side, the astonishing stable complex on the hill, Miss Frick still in residence across the street---well, it was almost more than my little heart could bear. The fences are still magnificent, but the stables are condo-ized, the grounds chopped up a bit (the double gate now landscaped one way on one side by the owner, and a different way on the other side, ruining the effect), but it's still an amazing site. As for the house, I'm often delighted by and a fan of the wacky baroque/colonial designs of Little & Browne, but this house was just bloated in effect and composition---as if someone had pumped it full of Helium and it was about to burst. Here's the bing link (http://binged.it/PFKWCo)---the smaller current house, built with some salvage from the big house, can be seen on the old terraces. The grand 'motor house' is a bit Northeast, and the stables across Hale Street. If one goes southwest, one sees the Loring House, one of the finest houses of the shingle style, by William Ralph Emerson. The story goes that when Frick tried to buy shore access from Mrs. Loring, who refused to sell, that when he upped the offer to whatever sum it was---10,000, 100,000, a million----her response was heavens no, what would I do with (10,000, 100,000, 1,000,0000)? It took so much less money to be rich back then. Great story.....either defeat the Nazi's or preserve the Frick's iron fence for posterity. Fine looking porticos and stonework on both major facades. Fantastic how the balustrade is carried up from ground level to the top of the courtyard brick walls and up further still onto the porticos and third floor parapet. A beautifully designed composition. Really love how the garage is an elegant mini version of the main home in details and massing too, even has its own columned portico. My dad's father listed his occupation as "Watchman" on the H.C. Frick estate in Prides Crossing on his WWI Draft Registration on June 5, 1917. His name was Andrew John McGann. 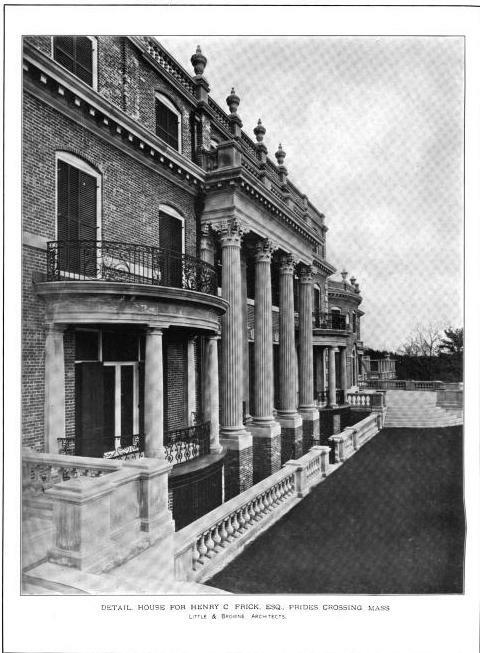 He later worked as head caretaker of the Robert Stowe Bradley estate where he lived in a house given to him on five acres just off Hale Street by Mr. Bradley. He and his wife, Minnie, raised five sons there, four of whom fought in WWII and one who fought in the Korean War. There are plans and elevations for a Gate Lodge" at Eagle Rock, the Frick Estate in Prides Corssing, Beverly. Do you know if it was ever built? Th Gardner's House still stands, much altered, as does part of the Stable, but I have not heard about a Gate Lodge. Thanks for any information you can send on this.